A performer hula hoops at a contest of the Drag Olympics at Yangon Pride festival in Yangon, Myanmar, January 27, 2019. As David Morena lightly powders his nose, he stops for a moment, gazes at his reflection and quickly assesses his stage make-up design one last time. “When I first heard Lady Gaga song I suddenly felt so free,” said Morena. For years, he was afraid to tell his family he was gay out of fear of being kicked out of the family home. But three years ago Morena decided to come out and to embrace his inner Gaga by performing in drag. This past weekend, pride week kicked off in full force in Myanmar’s largest city, Yangon. A flurry of rainbow umbrellas dotting Yangon harbor, held by fishermen following a flotilla of partygoers, set sail on Saturday. Followed by the drag olympics featuring a handbag throwing competition, a stiletto sprint and hula hoop contest. Hundreds attended the event and many travelled from across the country. Event organizer Hla Myat Tun, from the leading LGBT rights advocacy group, Colours Rainbow, said this event was not just about providing a safe space for the LGBT community to come together and celebrate, but also about inviting general members of the public to come and show their support. 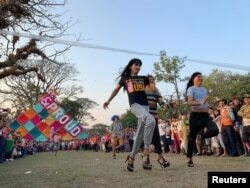 People take part in the Stiletto race of the Drag Olympics at Yangon Pride festival in Yangon, Myanmar, January 27, 2019. Wigs aside, Hla Myat Tun said there’s an urgent need to bring attention to the abuse faced by the LGBT community in Myanmar. “The greatest threat is the local level police,” said Hla Myat Tun. “Police particularly target trans-women too, they see them as a ‘walking purse’”. Although article 377 isn't strictly enforced, without legal reform, the prospect of gaining any legal protection remains elusive. Shin Thant has experienced sexual harassment at the hands of the police first hand. “They touched me and harassed me,” the 29-year-old said of her experience at a Mandalay police station six years ago. “Still we are seeing police use transwomen for extortion.” Crowned as Miss Trans Grand Myanmar 2018 winner, Shin Thant said she wants to be the first transgender member of parliament. Opposition or lack of political will? During the 1988 democracy protests, student leader Aung Myo Min faced discrimination for being the first openly gay man in the democracy movement and was eventually forced to stand to the side. “It was a struggle within a struggle,” he said. Since then he has been the director of the human rights education and advocacy program Equality Myanmar. Aung Myo Min believes there is a lack of political will to abolish the law that criminalizes homosexuality. He said there are many MPs who tell activists they are greatly concerned for the LGBT community and give moral support, but said no one is taking the initiative to lobby within the government. Performers hula hoop at a contest of the Drag Olympics at Yangon Pride festival in Yangon, Myanmar, January 27, 2019. ​Without a law change, the mindset of the wider community won’t change. “There is the Buddhist misinterpretation that to be gay or LGBT is to suffer bad karma, you did something wrong in your past life, that gay is something to be cured,” said Aung Myo Min. This year’s Pride events also questioned how LGBT people are represented on screen. The Myanmar actor who goes by the name of ‘Russel’ said he’s tired of seeing local cinema always poke fun at and discriminate against the LGBT people. Although this year was the biggest yet celebration, next year Shin Thant hopes to walk down the main street in Yangon holding the rainbow flag.